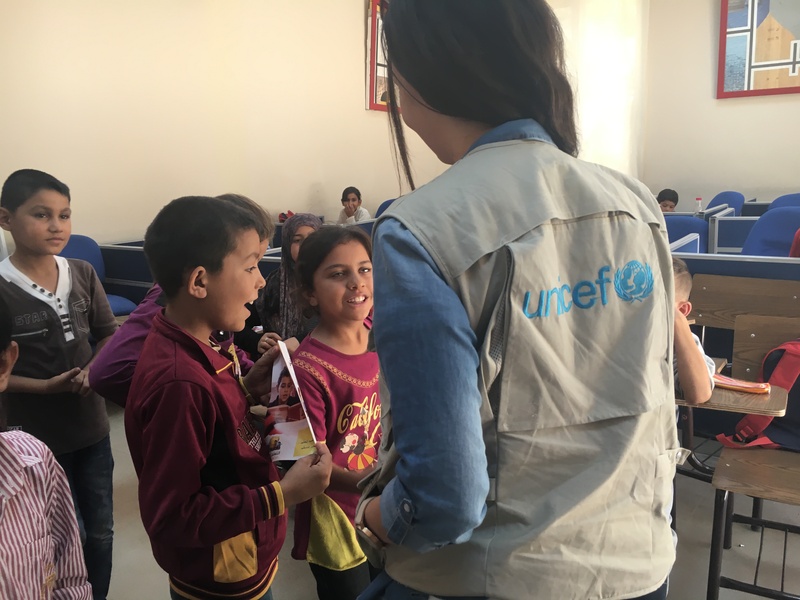 UN Volunteer Nadeen Al Hadidi serves with the United Nations Children’s Fund (UNICEF) in Jordan. She assures that international support provided by UNICEF, other UN agencies and civil society organizations reaches the most vulnerable. Nadeen participates today in the side event "Harnessing the Power of Volunteering to Achieve the 2030 Agenda" organized by the International Forum for Volunteering in Development (Forum) in New York, in the framework of the High-Level Political Forum for the Sustainable Development Goals (SDGs). I started my volunteering experience during my university years participating in various activities. Volunteering always provided me with a sense of self-satisfaction and happiness. Helping others and seeing the impact of my volunteering work on people’s faces has always been the driving force behind my courage to continue working for those that suffer the most. During my fourth year at university, I joined the United Nations Population Fund (UNFPA) as a volunteer. My experience with UNFPA involved supporting the monitoring and evaluation of development programmes, and the continuous visits to the field made me more passionate and gave me the drive to continue my volunteering work. Volunteering is very popular among university students in Jordan, and many participate in activities conducted inside and outside the university’s premises. The concept of volunteerism is deeply ingrained among Jordanians, understood both as giving back to the community as well as getting extra knowledge and improving career prospects. After graduating from university, I became a UN Volunteer Field Monitor with UNICEF, also in Jordan. This assignment gives me the chance to help others, especially children, and to conduct field research about current and future projects of the organization . As a Field Monitor I am in direct contact with communities, which helps me better understand the needs of local populations. I assure that international support provided by UNICEF, other UN agencies and civil society organizations (CSOs) reaches the most vulnerable. As a UN Volunteer, I give without expecting anything in return, making sure that the needs of every child are met and their human rights fulfilled. Volunteering in Jordan is part of the traditional culture, and volunteering work is run mainly by CSOs together with the government and various UN agencies, all trying to support local communities in different locations across the kingdom. Volunteering efforts are currently concentrated on a wide range of projects designed to help refugees residing in Jordan. Jordan’s geographical location, amid countries in conflict within the region, make it a preferred destination for refugees, thus creating opportunities to be engaged on a large scale in volunteering projects throughout the country, in collaboration with the government, the private sector, CSOs and UN agencies. Countries in the Middle East and North Africa (MENA) region share similar demographic characteristics, including their young populations. Two thirds of Jordanians are under the age of 30. This presents both a challenge and an opportunity. Studies have shown that youth make up a large percentage of volunteers. The opportunity comes from the huge potential and capacities of young people, the challenges from the urgent need to create initiatives where youth can volunteer for their communities. Increasing opportunities for Jordan's youth to volunteer in programmes designed to achieve the SDGs will certainly have a major impact on their future and the future of their communities. Youth can play a major role on SDGs implementation by empowering local communities, planning, implementing and evaluating programmes and advocating for positive change through volunteerism in Jordan. An example of the role youth volunteers can play in the development of their communities is clear from the comprehensive study that was conducted in Jordan, where 22 pockets of poverty were identified. Under SDG 1 on eradicating poverty, several programmes were implemented in these pockets to support the economic conditions of local communities, and as a result, these pockets were reduced from 22 to 18 within a year. This included major achievements in terms of education, health and other basic social services, and volunteers were major participants in the implementation. Since then, some private sector companies, UN agencies and international CSOs started to put more emphasis on youth involvement by having more volunteering opportunities for youth in their programmes, which led to young voices being heard and provided the opportunity for youth to learn from those with more experience.